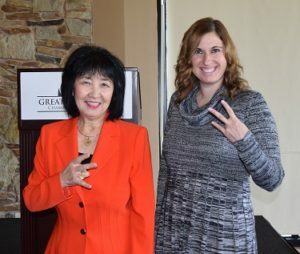 In a room filled with women, and a few men, Dr. Christine Kajikawa Wilkinson, CEO of the ASU Alumni Association, shared her life experiences, the important role first impressions play in business and how to best foster innovation, manage change and impact others’ lives. “What do we consider about individuals when they walk into the room?” she asked the crowd at the Nov. 2 Professional Women’s Alliance lunch. The answers she received included items such as appearance, clothes, expression and stance. For Wilkinson, first impressions play a big role in her professional story and how she conducts herself in business. “Most of us can’t do anything about [our] age, race or gender,” said Wilkinson. Despite this though, those three core components play a pivotal part in first impressions. People will make judgments and assumptions about you based on three things that no one can control. “It is interesting to watch people go up to my husband and ask what he does while bypassing me,” said Wilkinson, who shared that her husband then points to her and explains that she’s the “interesting” one. Her anecdote is just one example of how women are still overlooked when it comes to business and leadership. While gender shouldn’t play a role in how men and women are perceived in the workplace, it does. In fact, according to Wilkinson, it often determines how well an individual is perceived to be performing at work. “In business, when a man enters the room that person has to prove they’re incompetent. [They are] assumed to be competent,” she said and explained that for women, it is often the opposite. Women are expected to “prove” themselves capable of doing a particular job. Wilkinson herself experienced this bias. She said that when she was serving as ASU’s athletic director the first person to compliment her alluded to the fact that she was appointed to the job because of her father’s work. “I said, ‘No, it was because of me,’” said Wilkinson. Her time as athletic director was the first year that Arizona hosted the super bowl and it was successfully hosted at ASU. Despite her many negative experiences both in school and business where she has been judged based on her race or gender, Wilkinson maintains a positive attitude. Shifting gears to her current role as CEO of the ASU Alumni Association, she spoke proudly about the institution’s reputation for innovation. ASU is ranked as the most innovative university in the country. In Wilkinson’s eyes innovation, disruption and change are just things people have to adjust to handling. Eighty-five percent of new jobs that will exist in 2030 haven’t even been thought of yet. Trust your team. Trust your leader. Honor your traditions by maintaining your organization’s core values. Evaluate what you should be doing. For Wilkinson, her tool for success, moving beyond bias and managing innovation is to laugh every day and stay positive.